Previous appearances in film, television, and Netflix Originals. Owners are flexible and accommodating. Custom Estate (9,000 sq. 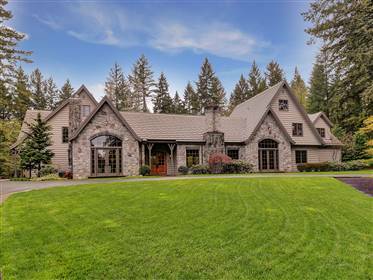 ft.) on 6 acres inclusive of landscaped yard, pool and spa, blueberry orchard, old growth conifers, and running creek. Incredible great room with soaring ceiling and stone fireplace.